The word rectenna is the combination of the abbreviated words rectifying and antenna and it basically converts radio waves into electricity. 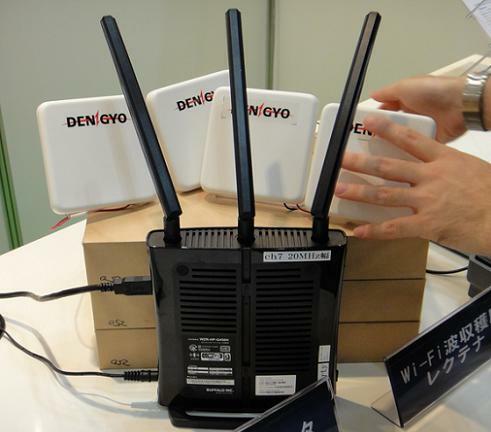 The rectenna, developed by Nihon Dengyo Kosaku, is relatively thin, at 12mm for Wi-Fi and 30mm for digital terrestrial broadcast waves, and uses only 50µW of power to start. It can generate power in the order of micro-watts at a distance of around 10cm with the help of wireless LANs. New concept is to collect electricity by collecting electrical waves within the office or at home, or by attaching this rectenna to an outside wall.They harvested about 1.2mV and 0.06µW of power inside the exhibition hall at Tokyo Big Sight, from digital terrestrial broadcast signals sent from Tokyo Tower which is about 5.5km away. For receive more information watch video bellow.